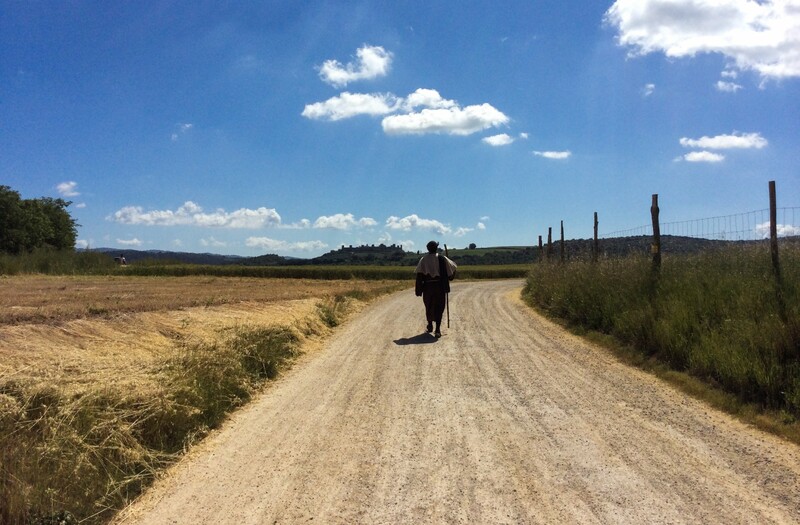 I’m still waiting to wake up and find out it really was just a dream, this amazing day on the Via Francigena. 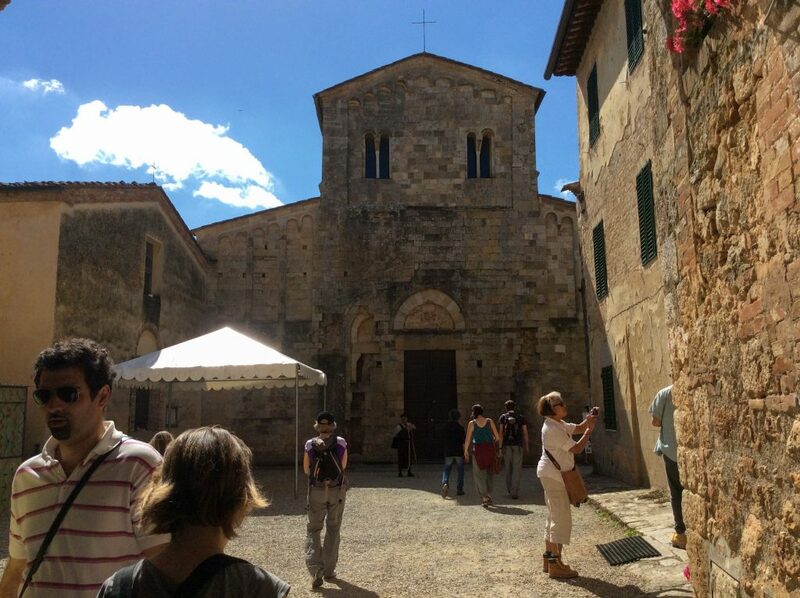 Greeted by an azure morning sky, a stark contrast from the previous day’s low grey skies, we said our farewells to the wonderful folks at Relais La Costa and headed by van to the tiny but historic community of Abbadia Isola, a short distance due west of Monteriggioni. 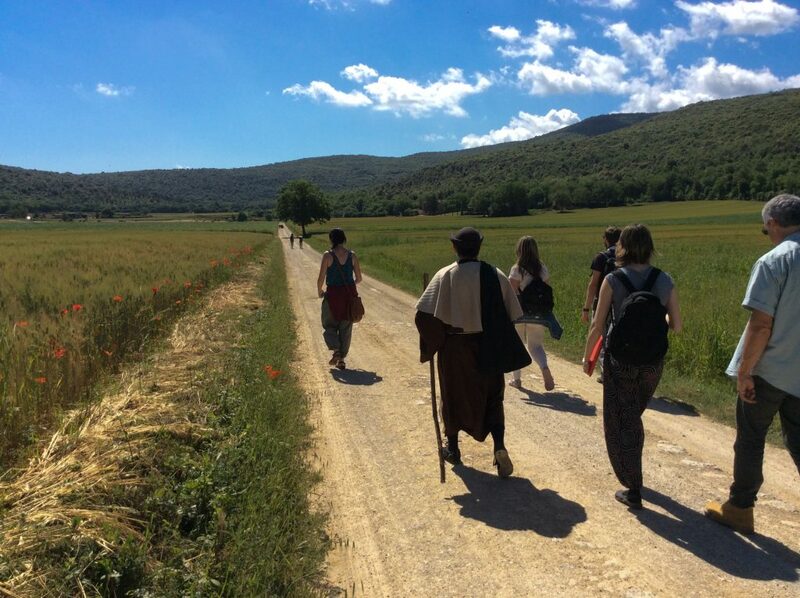 First documented in 990 by Segeric, the Archbishop of Canterbury, who so conveniently recorded the route he followed on the Via Francigena, this area was known as Borgonuovo – a mere submansio, or “halting place”, for weary pilgrims. 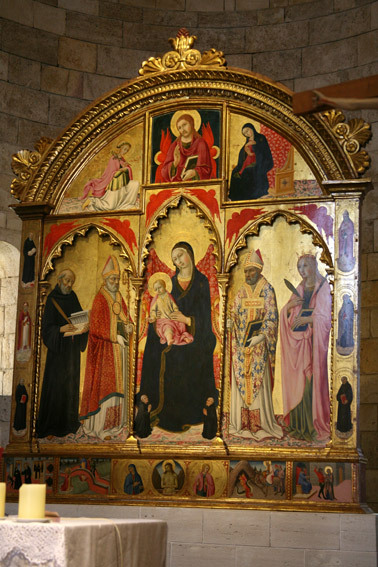 However, in 1001 a wealthy widow by the name of Ava Lombardi (as in the then-ruling class Lombardis) built a monastery in honor of her family and christened it San Salvatore. 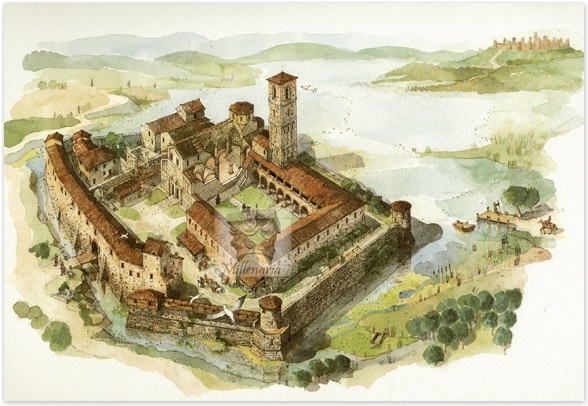 By 1173, a new abbey church in honor of St. Cirino was constructed as a part of this compound, and the now strategic town of Abbadia Isola, meaning Island Abbey due to its position on high ground surrounded by marsh, was a major waypoint for travelers along the Via Francigena. The town also gained importance related to its position on major crossroads between ruling/warring city-states such as Florence, Siena, and Volterra. 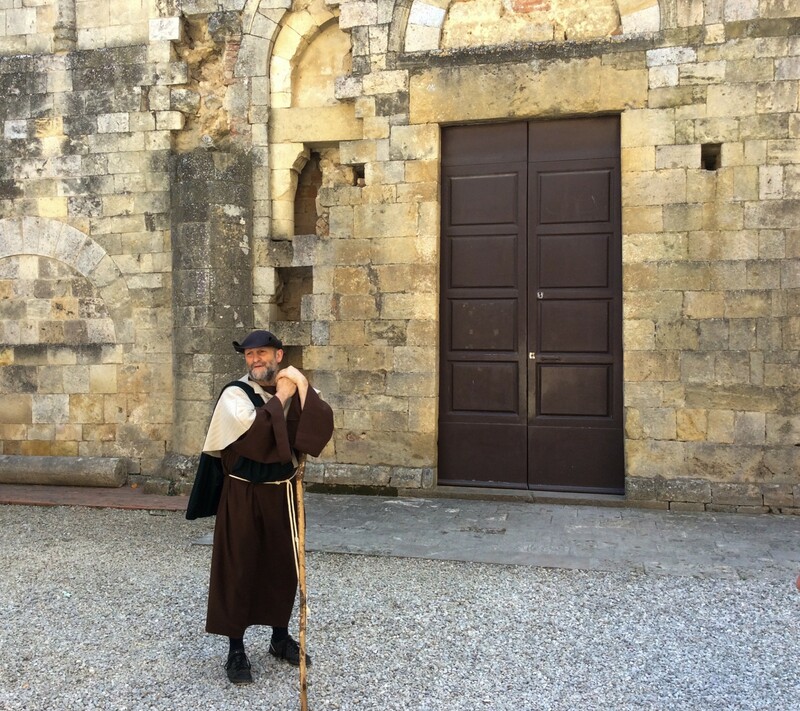 We approached the old stone church and there awaiting us was the first of many historical characters who would guide us on our upcoming path — a pilgrim on his way to Monteriggioni just as we were. He lead us into the cool darkness of the abbey and as our eyes adjusted, we beheld the regal, understated elegance of this ancient dwelling. 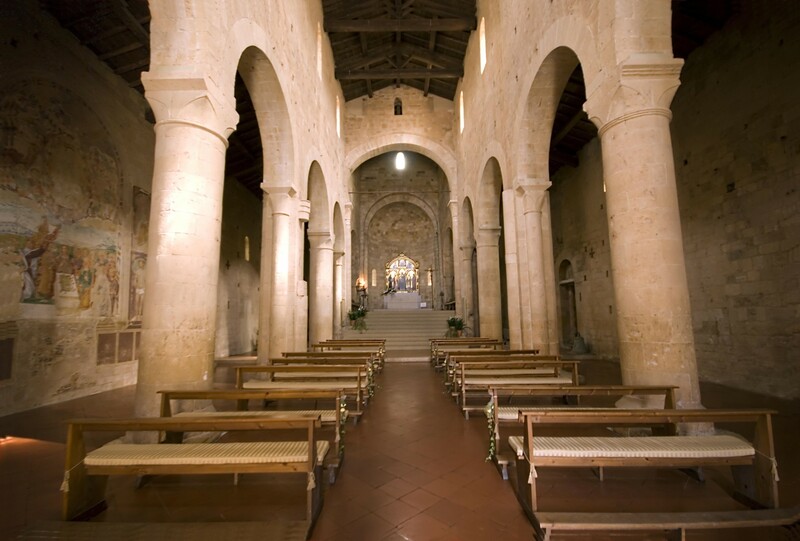 Built in traditional Basilica style with a central nave and two side naves separated by massive columns, the church is crowned at the alter with a beautiful Romanesque dome and a stately polyptych, or paneled painting, by Sano di Pietro dated 1478. The remains of the two lesser doors on either side of the main entrance can still be seen; these are typical of pilgrimage churches and allowed the pilgrim to enter from the right and exit from the left as a symbol of his visit and continuing journey. Take all that or leave it — it was hauntingly beautiful, and made even more so as I reflected on all the many travelers who had found sanctuary here on their long journeys. 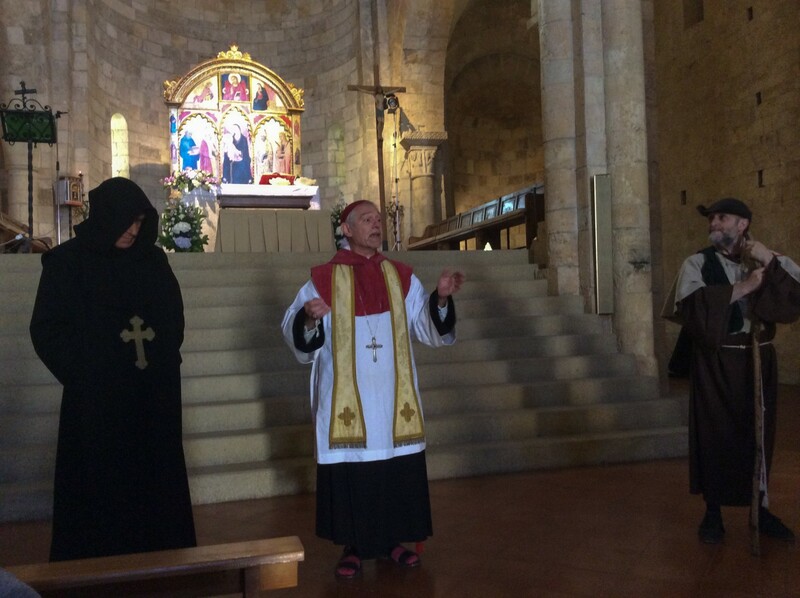 As we admired the interior, the outline of two figures emerged from the shadows of the apse – one donned in the cloaking of a parish priest, and the other hidden behind the dark veil of a monk’s robe. We took a seat and listened as the priest spoke, albeit I was only able to understand brief bits here and there (and so wished my handle on Italian were better!). The gist was of our journey ahead and our seeking, like all other pilgrims, of unity, forgiveness, and reflection. The sights and wonders along the way were multitude. 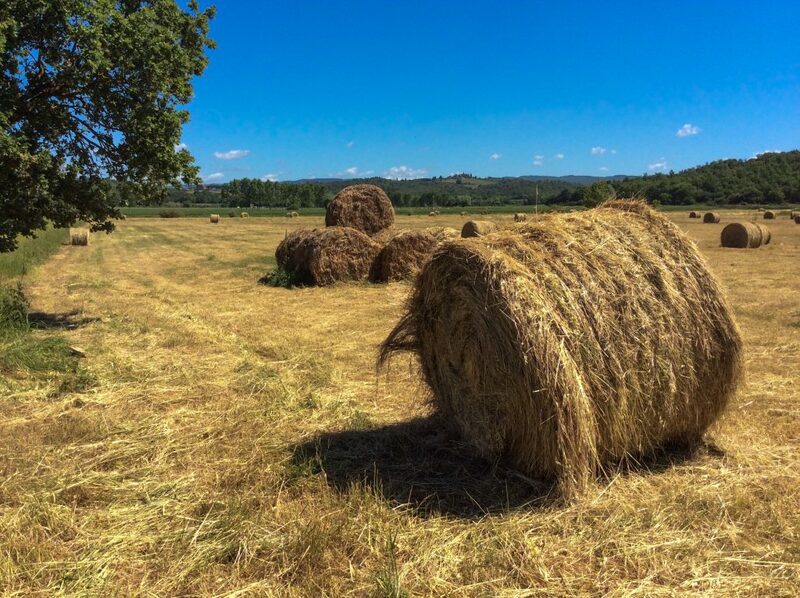 Blessed with what had to be the most gorgeous spring day in Tuscany in all of 2014, we followed the road under dazzling sunlight and radiant blue skies. 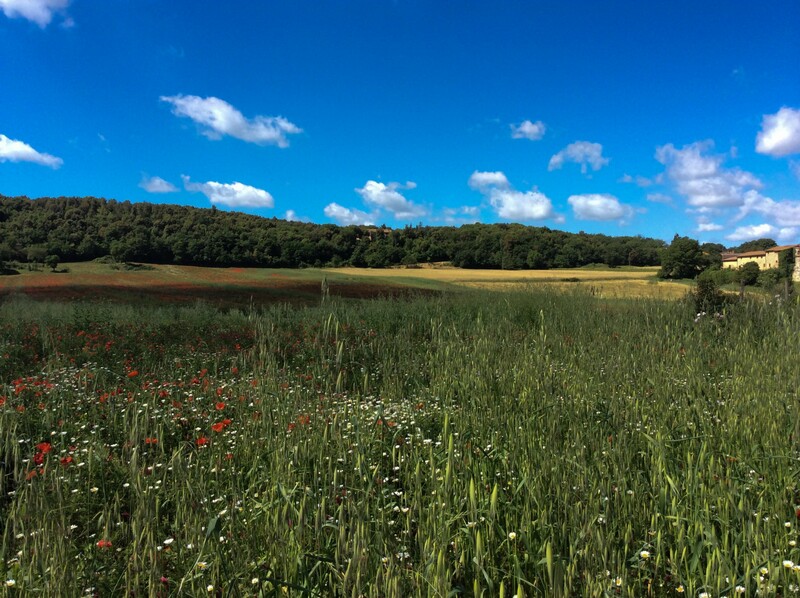 Poppies announced themselves in full glow as they danced amongst the wheat and other flora blanketing the countryside. Other wildflowers joined in and the tapestry created was breathtaking. 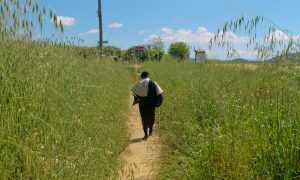 Making it even more spectacular, a gentle breeze cooled us just enough as it brought with it the scents of fresh-cut hay and fragrant grass. 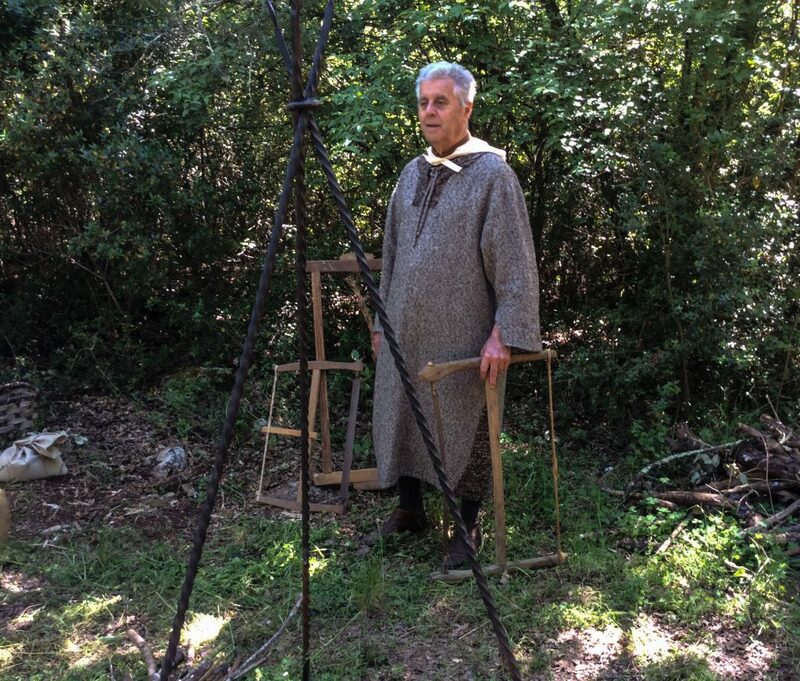 Along the way, as I mentioned earlier, we met more than one character who so richly added to the experience of being spirited back in time 600 or so years. I’ll take you on those portions of the journey mostly by photos — sometimes a picture really does carry the worth of a thousand words! 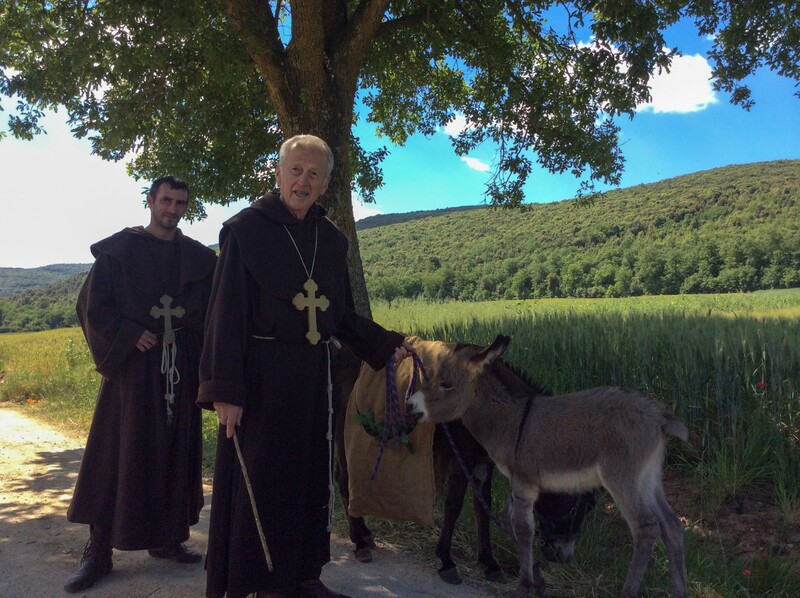 Journeying in opposite directions, we met two monks and their furry friends on the way to Abbadia Isola. Of what did these do so quietly speak? We left open sky and entered the first section of the forest shaded trail. 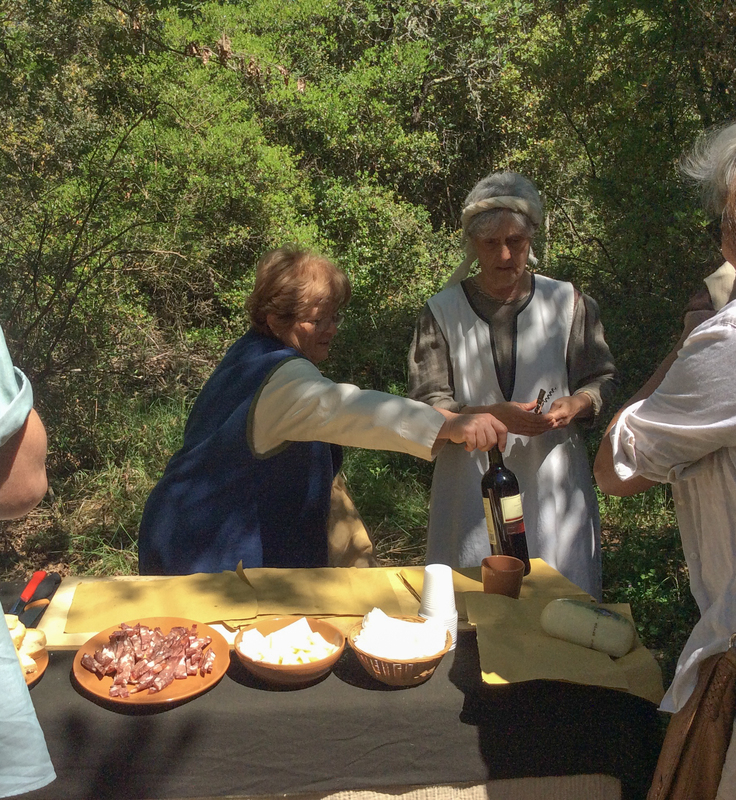 Rounding a bend, there awaited a most welcome sight… two medieval women offering refreshment to us weary travelers! 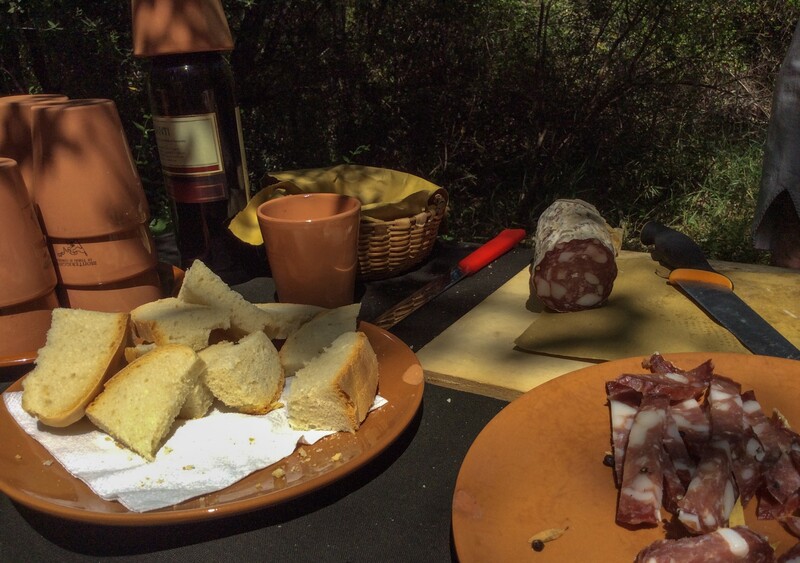 Cheese, bread, salume, water, and wine made a feast fit not only for a pilgrim, but for any lucky king on this fine day. 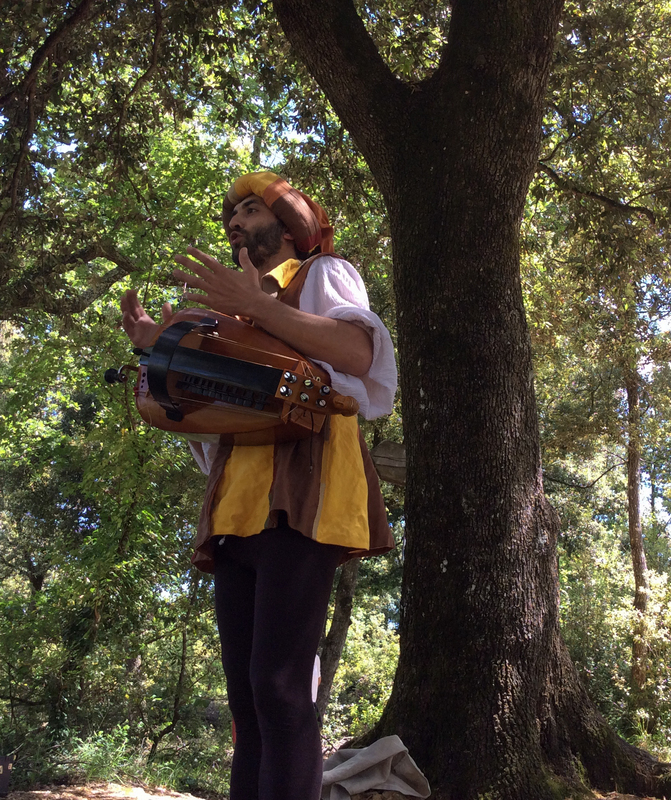 A troubadour plying a melody from a vielle, a popular instrument from the 13th – 15th centuries and later known as a hurdy-gurdy, was Pied Piper-like drawing us in. I’d be lying if I said I wasn’t thoroughly enchanted! We enjoyed several tunes and a brief bit of explanation as we rested under cooling shade. Admit it – you’d want a picture with this guy, too! Our journey continued as we ventured on through the forest. 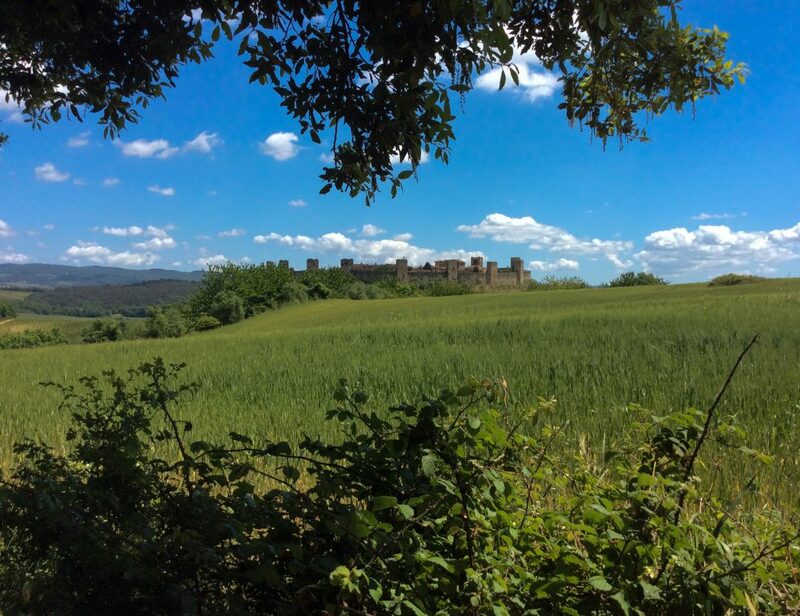 Reaching a clearing, we caught closer sight of Monteriggioni and her crown of towers, only seen from afar earlier in the day. One can imagine the relief pilgrims of old felt as they drew closer to refuge and safety, at least for one night. All was not well, however, as two armed figures approached…and they were not smiling. Commands were made to stay in place as they drew near. 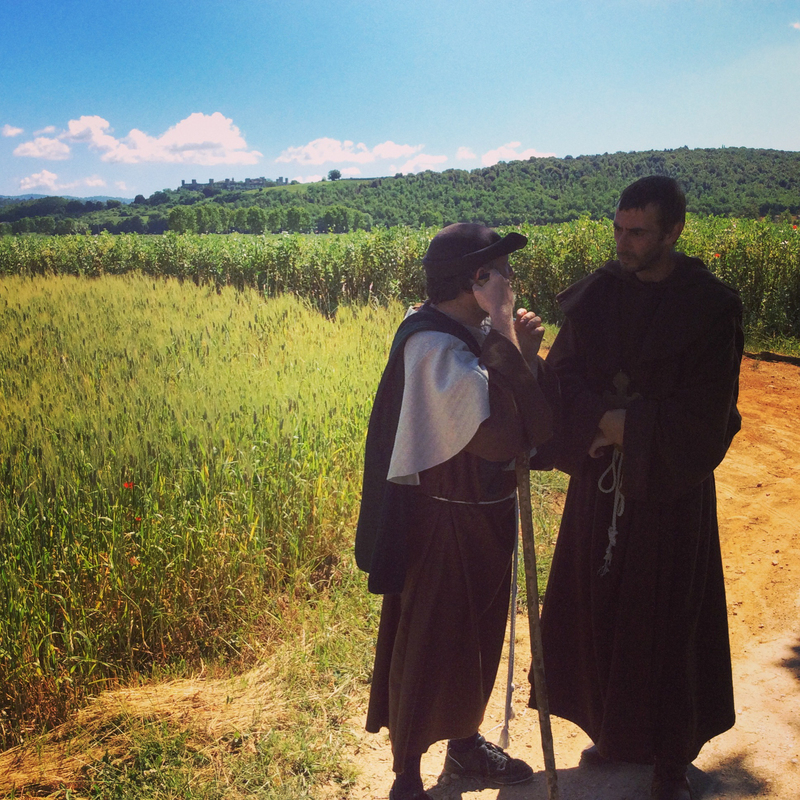 Our pilgrim guide stepped forward and during a brief conversation explained that our intent was peaceful; we were pellegrini, pilgrims seeking only haven in Monteriggioni. 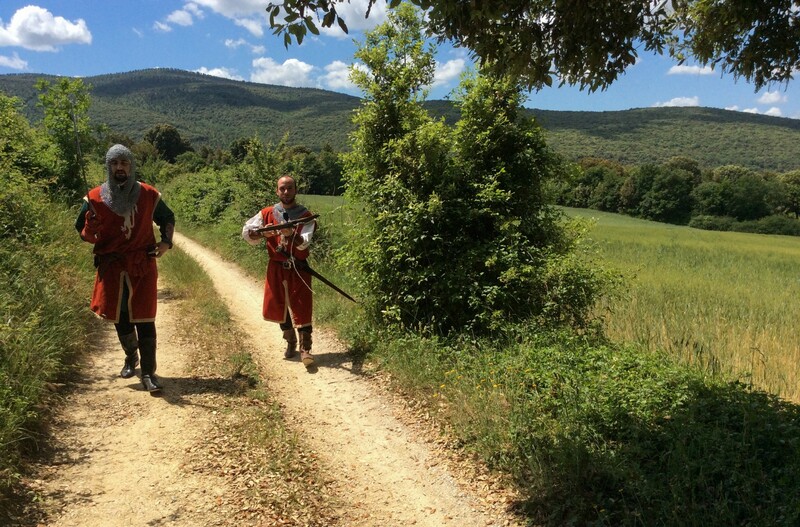 Finallly satisfied, the two guards stepped aside and allowed our passage onward. 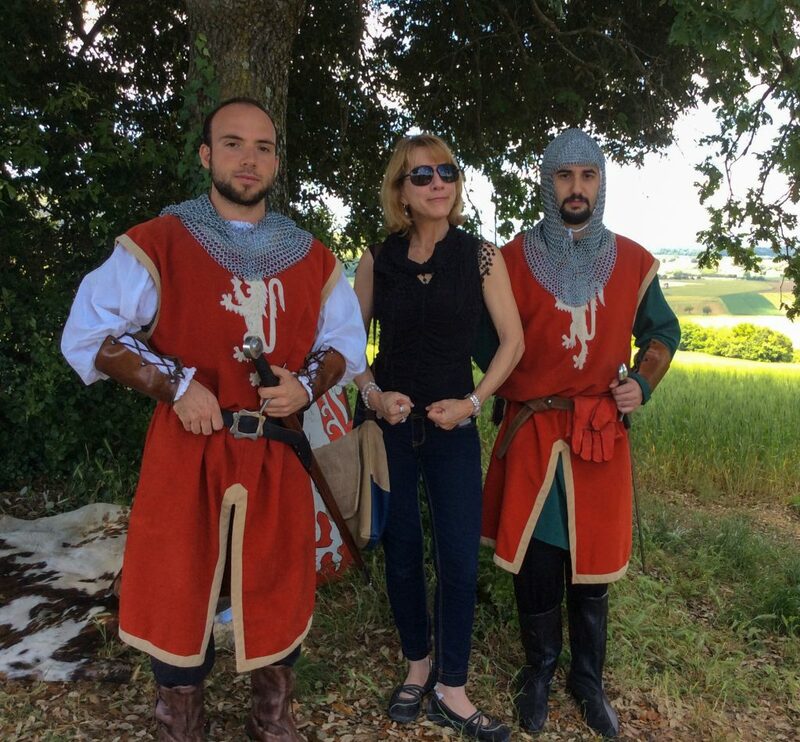 Well…and they also allowed us to hang out awhile under the trees with them and admire all their knightly things, take a few snapshots, and have a few laughs. Those knights…! You’d have done it, too…! Our brief pilgrimage was nearing an end. 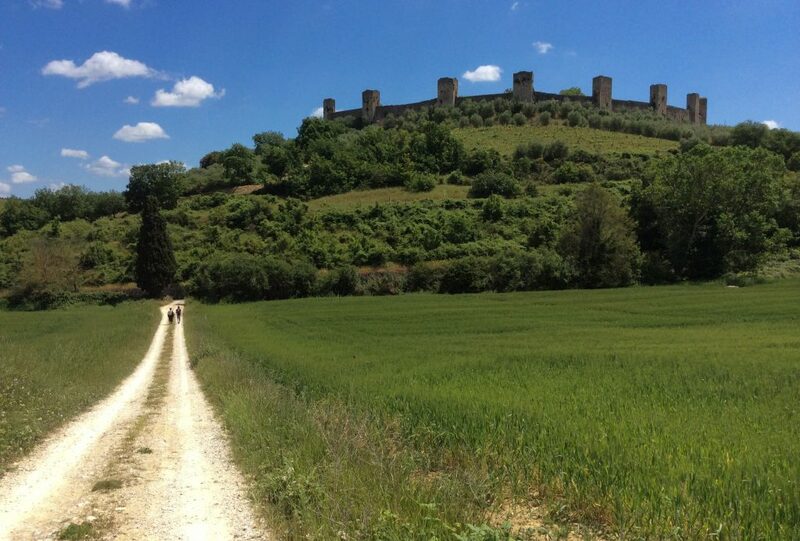 The straight road towards Monteriggioni and a steep uphill trek were all that remained. 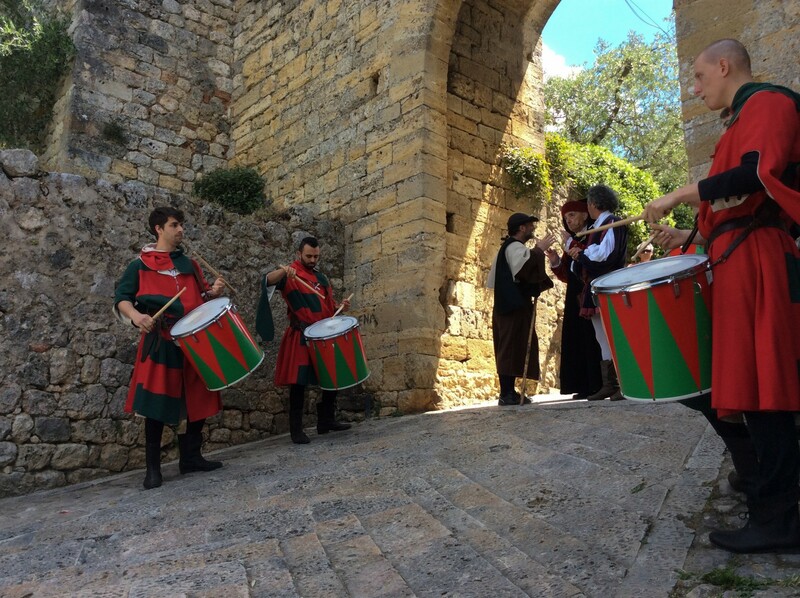 As our road weary feet (and my blistered heels) made the last of the rocky trail towards the gate of Monteriggioni, a steady drumbeat was heard; my heart quickened as we drew closer and I caught a glimpse of the brilliant green and red uniforms stationed at the gate. 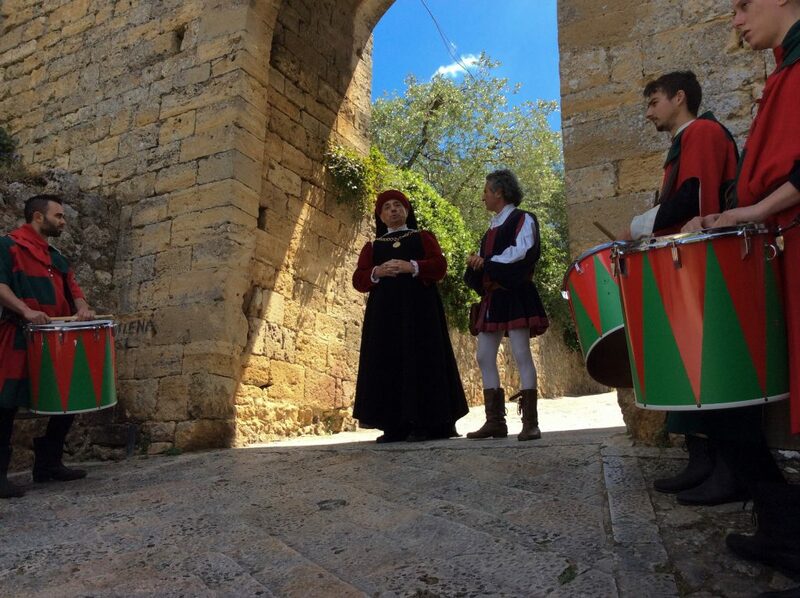 Awaiting us was the sindaco, the mayor of Monteriggioni, to offer welcome and greeting to our dusty band of pellegrini, but only after conferring with our guide and documenting our true intent as pilgrims. The drums continued until the last of us had settled outside the gate to listen. 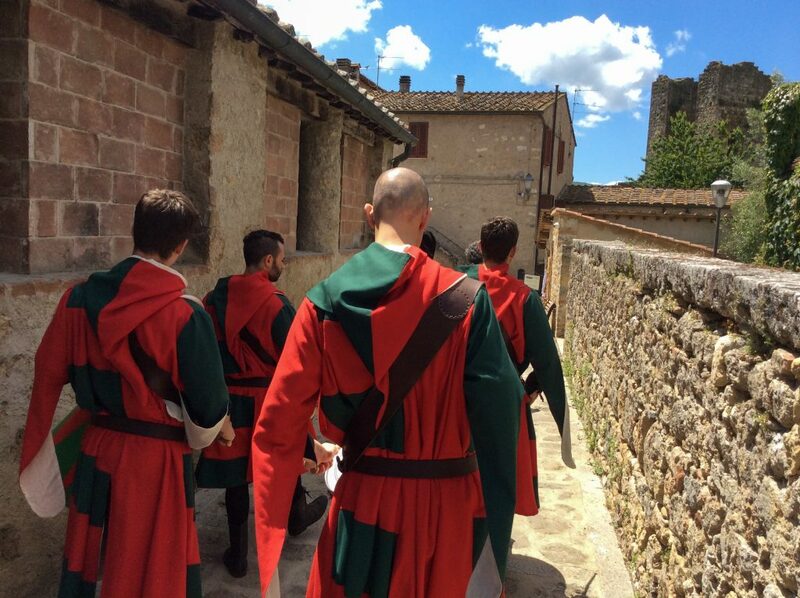 Officially feted to enter, we followed the procession through the portal and into the town. 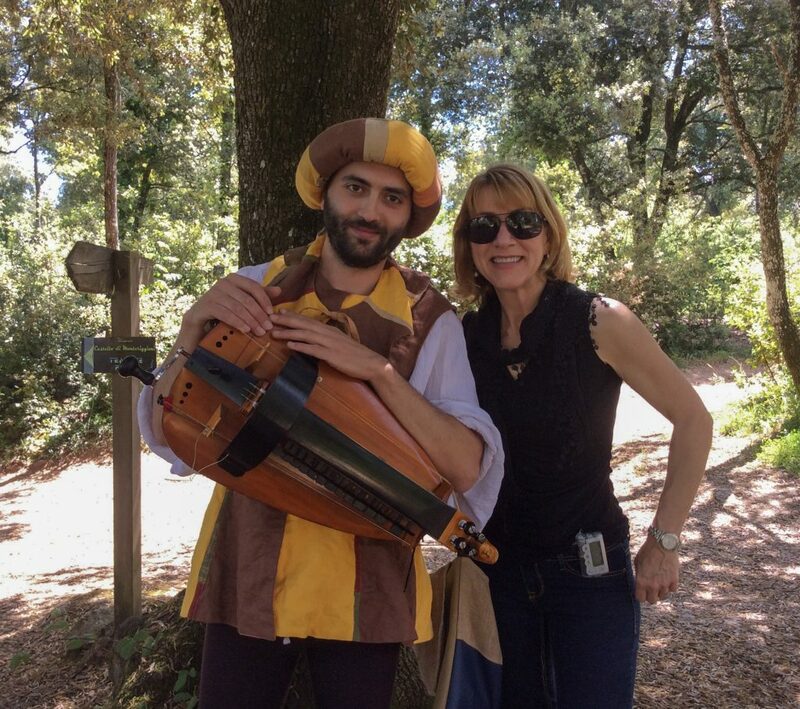 It was quite fun and just another segment of “dream come true” for this traveler. Our little parade certainly provided some good photo ops and gawking for other tourists, as well! 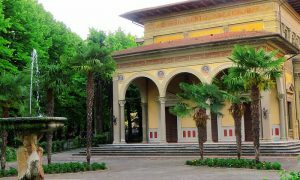 Our array came to rest at the door of a newly opened (that very day, I believe) venue called Prodotti di Filiera Corta. 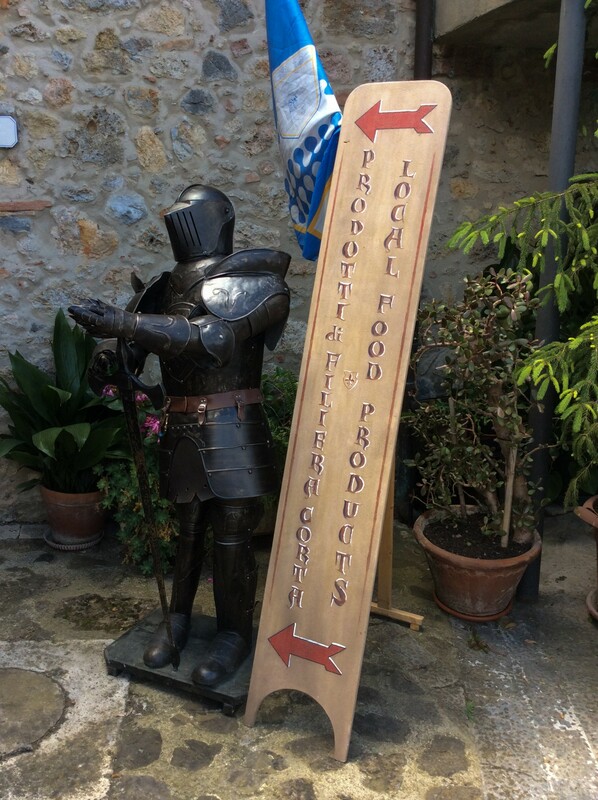 This quaint shop has set a mission for itself to serve as an actual place of refreshment for modern Via Francigena pilgrims, as well as others. 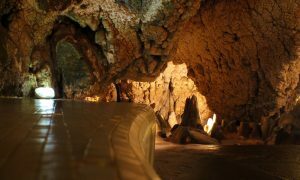 The interior is designed with a number of age-old relics, as well as a non-functioning water trough that no doubt satiated many a thirsty ancient hiker. 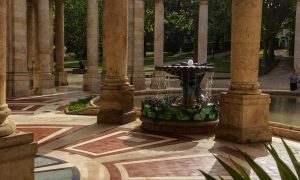 The term filiera corta actually means short chain, and the idea is to cut out the middle man in the production of quality food and drink products. Based on what we saw that day amongst the luscious meats, cheeses, panini, wines, honey, etc., I’d say they are off to an invigorating start. 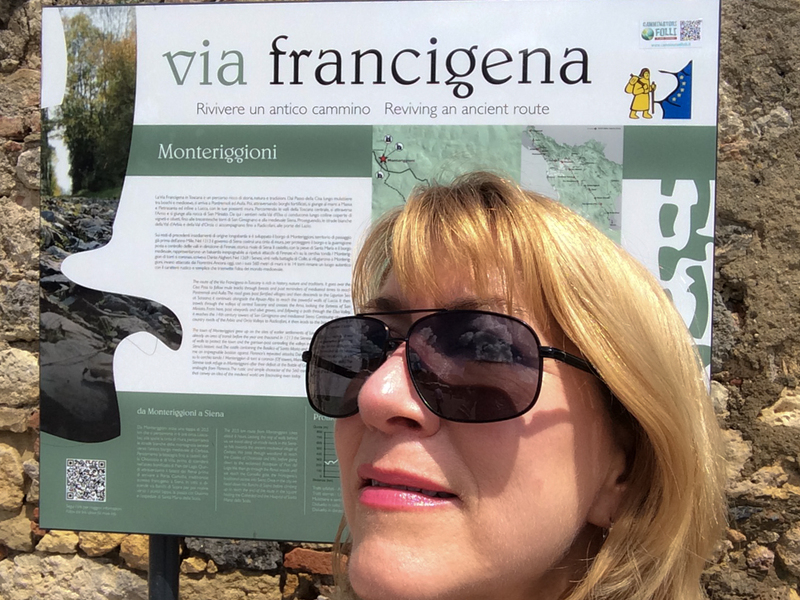 With a little time to rest and wander in the main square of Monteriggioni, I found myself in front of the sign that I had first read exactly two years ago on a visit to this favorited Tuscan town. 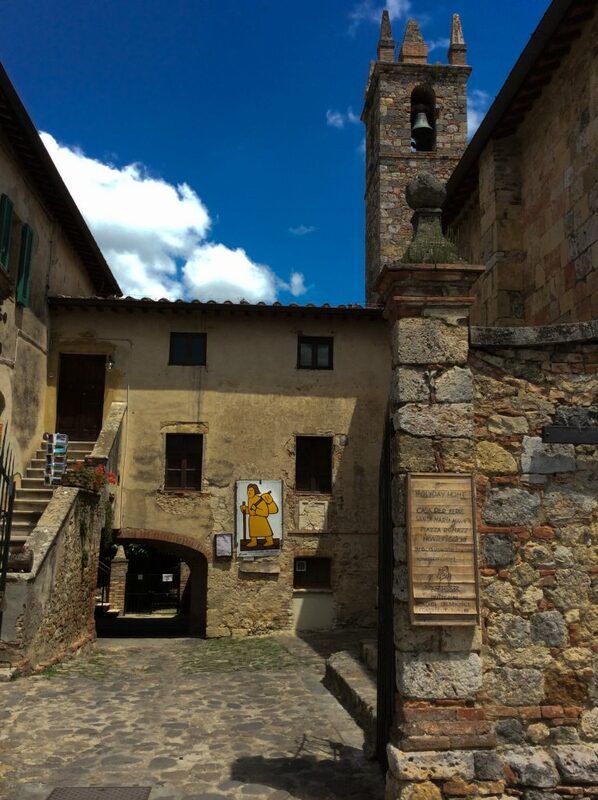 It spoke of the Via Francigena; how Monteriggioni was an important way-point then and now; of the Pilgrims’ hostel that was located adjacent the church, just as in days of old. 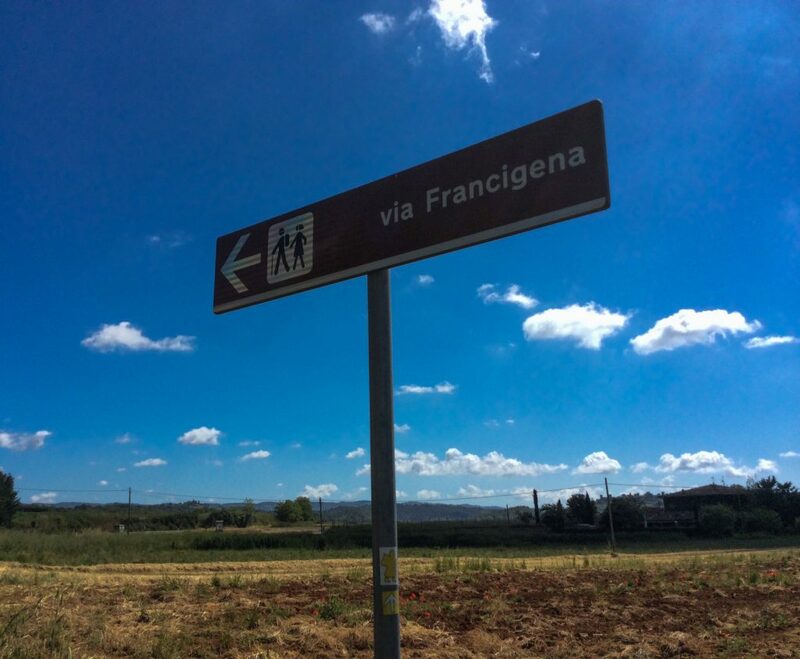 I was intrigued – even took a photo of the sign with the mental note attached of “some day…” – and here I was, wearing the dust of the Via Francigena over an incredibly satisfied heart and soul. 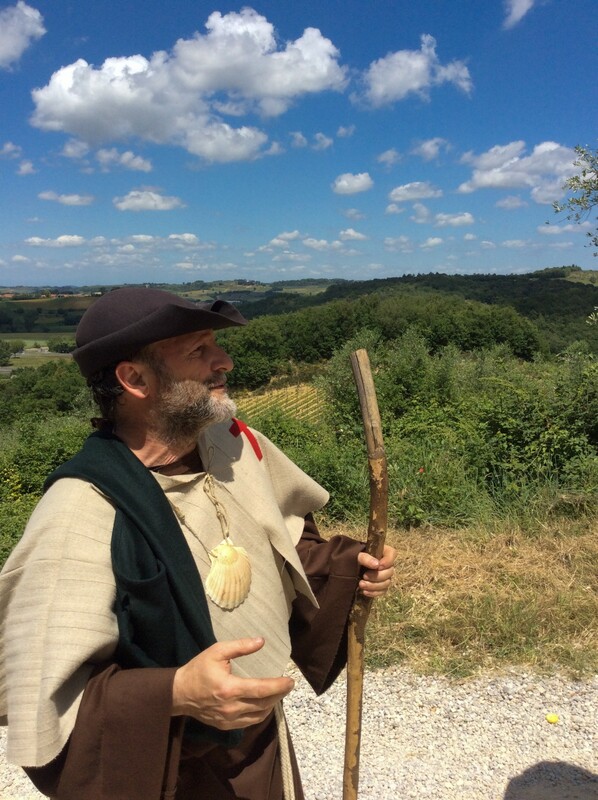 I felt exceptionally lucky and blessed for the experience, the dream come true, of such a grand introduction to this special road of the pilgrims, this Via Francigena.